Little notes from Heather and Martin: A short visit to Serbia! Ages ago, I noticed that the Pt. Chevalier Serbian Orthodox Church has a monthly bake sale. Today, for the first time, we were able to go along. The food all looked yummy, but I was really taken by the main sanctuary of the church. I asked if I could take some photos. They not only said 'yes', but two women generously took turns explaining it all to me. Above is a view looking towards the front of the sanctuary. I assumed the wood panelling at the front was a wall, but it transpired to be a screen. The priest goes behind this to prepare the communion, as well as to speak at least some of the words of the service. The gold domes on either side above the screen itself mark panels that are doors - I think the central blue bit might be a door, too. The panel to the left of the blue section depicts Mary with baby Jesus, and Jesus himself is on the right. I'm not sure who the others are, but I suspect the one on the far right is John the Baptist. Several things really struck me about the space itself. The absence of chairs. Like the Russian Orthodox, the Serbian Orthodox stand for their service. There were benches around the edge of the space, presumably for those who couldn't manage standing. Everyone faces the altar (which is behind the screen). So, whoever is reading from the lectern you can see at the end of the carpet has their back to the congregation, as does the priest. The people worshipping here are truly 'surrounded by a great cloud of witnesses'. Everywhere were images of saints: the chandelier even had a ring of small images of saints on both the inner and outer surfaces, and the walls all featured large icons. Both women clearly knew the stories of the people represented around them. I felt something of the weight of the iconoclastic practises of my heritage: our churches are so bare, compared with this space full of images. Next to the cross at the right-hand side of the building was a small table with a bowl. For communion, they bake special round bread that has an affirmation about Christ stamped in the centre. The priest soaks that central portion with communion wine, and cuts up the edge section into small pieces and puts them into this bowl. If you've fasted before the service, you can take 'proper' communion (the wine-soaked bread) but if you haven't, you can still take the bread that's in pieces in this bowl. The small table on the left at the front of the church has a container of holy water on it. One of the saints on this side was St. Nicholas (as in Santa Claus). It was interesting hearing the women who were explaining it to me talk about their faith. The one who spoke the most was from the north of Serbia, an area which was once part of the Austro-Hungarian Empire. There are a lot of Western European influences in that area, apparently, and she didn't grow up Orthodox: one of her parents was Protestant, the other Catholic. She converted when she married into an Orthodox family. She spoke of being very grateful to have grown up in a country where she could find and join the Orthodox church. She thinks that 'Orthodox' is a word that has negative connotations for many people, but to her it is precious because it represents 'original' Christianity. She spoke of the younger branches of the church as having a corrupted gospel, because they're always changing things, whereas theirs is pure/authentic because it still uses old forms. For example, they use two liturgies in their services, one of which was written by John Chrysostom, who lived from 347-407AD! Chrysostom means 'golden-mouthed', a moniker he was given because of his way with words. She also liked that they didn't have a choir who gave the peoples' responses in the liturgy, as some branches of the Orthodox church apparently do, but that the whole congregation get to join in. It felt quite different from the evangelical Christianity with which I am familiar: we value searching the scriptures for ourselves and our individual encounter with God, whereas here there was a strong emphasis on passed-down wisdom. It was also very reverential, in contrast to our emphasis on intimacy with God. 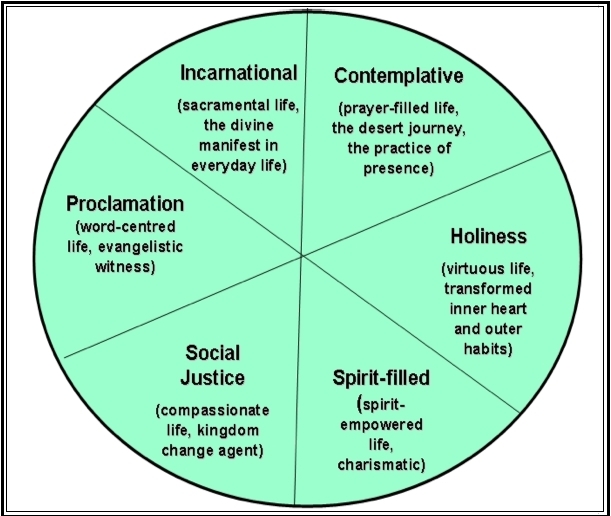 It made me think of Richard Foster's six streams of Christianity (illustrated here): I have been mostly shaped by the Proclamation stream, with elements also of Social Justice, Spirit-filled and Incarnational. In contrast, I suspect these people are mostly shaped by the Holiness stream - something that I have little experience of. The women showing me around were both very enthusiastic and very generous with their time. I got the impression that not many of the people who come to buy their baking also want to know who they are! It was also striking how much they struggled to describe religious concepts to me: clearly speaking about their faith and religious practises is something they rarely do in English. And now to the baking! We shared the savoury pastries for lunch. The rectangular one is stuffed with cabbage, the coiled one with mushroom (my favourite) and the square one in the front with spinach and feta. I think the monthly Serbian bake sale probably keeps a few filo-pastry-makers in business - the quantities on display were amazing! As was the amount on oil... It was all very yummy, but it's probably for the best that it won't be easy for us to go very often!